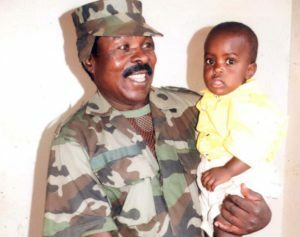 Sgt Kifulugunyu with one of his children. Courtesy photo. Sgt. Steven Ssempagala aka Kifulugunyu is by no measure a happy man. The ex- soldier who composed some of the morale-boosting songs during the National Resistance Army (NRA) bush war, today sells kaveera water, music CDs in public places and pop corns. He seems not to be enjoying his retirement. “Life has not been good. I served government for 43 years but I have nothing to show. I only got a retirement package of Shs8 million which I used to buy a plot in Ttula Kawempe and constructed a small house through hard struggle,” he said. Kifulugunyu says he used his house as collateral to obtain a school fees loan for his children and he has since failed to pay back the loan and the house is up for sale. “I am not getting any pension, I have no productive business, so I am in a desperate situation,” says Kifulugunyu. Kifulugunyu was born on January 8, 1937 to Elifaza Bulasiyo Mwebe and Phoebe Nalumanga in Namiringa Village in Wakiso district. He dropped out of school in Primary Four and became a mechanic. In 1964, he joined the army and served for 43 years. He retired in 2008 at the rank of sergeant. Kifulugunyu is the singer behind songs such as Kino kyekiseera, O’motonawaaka, Nitasonga and Kibonge, among others. The retired soldier is married to Saudah Nalubega and claims to have fathered more than 40 children.